The first MainLinesEast! "Top Site Award" is presented to Christopher Carpenter. Webmaster of Rails of New England. A top site! Congratulations, Christopher! The SECOND MainLinesEast! "Top Site Award" is presented to: Jerry Jordak, webmaster of: Penn Central Homepage! A top site! Congratulations, to my friend, Jerry! The THIRD MainLinesEast! 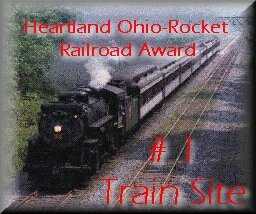 "Top Site Award" is presented to: Clint Chamberlin, webmaster of: Railroading in the Northeast, Homepage. A TOP SITE! Congratulations to Clint! The Fourth MainLineEast Top Site Award is presented to Webmaster, Jerry Hartzler. For his TOP SITE, The Ol' Hook and Eye. Check it out! Congratulations, Jerry! The Fifth MainLinesEast Top Site Award is presented to webmaster, Chris Denbow. For his TOP SITE, Train Gifs Station. Check it Out! Congratulations, Chris! The Sixth MainlinesEast Top Site Award is presented to the Webmaster of The Edaville RR for his Top Site. Edaville Railroad Bill, volunteers at the nations oldest 2'ga. RR & his wife - Total Train Nuts! work gratis at Edaville. And, the website's their tribute! The Seventh MainLines East Top Site Award is presented to Ronald Ciejka, Webmaster of Western Mass Rails. Ron has done a top job an a top site with lots of info and images. It's worth many visits! Congrats Ron! The NINETH Top Site award goes to Richard, Owner of All Aboard N Scale Trains. Richard created his site to share his layout and create a place for other N scalers to come and gather info. As well, there's an interesting discussion group for N scale enthusiasts. The site is very well written and is easy to navigate. Great work Richard and Congrats! The TENTH Top Site award goes to Scott Dunlap, Owner of The B&O Railroad Network. Scott created this B&O site for die-hard enthusiasts. The site is Excellent and dear to my heart! (I'm a Baltimore WEST engineer at CSXT.) Scott... Congrats!